Just feeling lucky to get our hands on one of Creative's latest product, the Sound Blaster Axx 200. Its not really a Sound Blaster sound card which we are all too familiar. Its a wireless speaker with the Sound Blaster with built-in Sound Blaster SB-Axx1 chip and its jam packed with many features such as wireless, NFC, bluetooth connectivity, super megaphone and many more. they are doing well this time! go check out their website. sound blaster roar delay from late march to late april and now to 6 may. worldwide launch? us launch? delayed indefinitely. it is easy for competitors to sabotage their production since they are not used to producing large volume for a long time. cnet.com and engadget have not mentioned or reviewed any new creative products for a long time. deliberate? 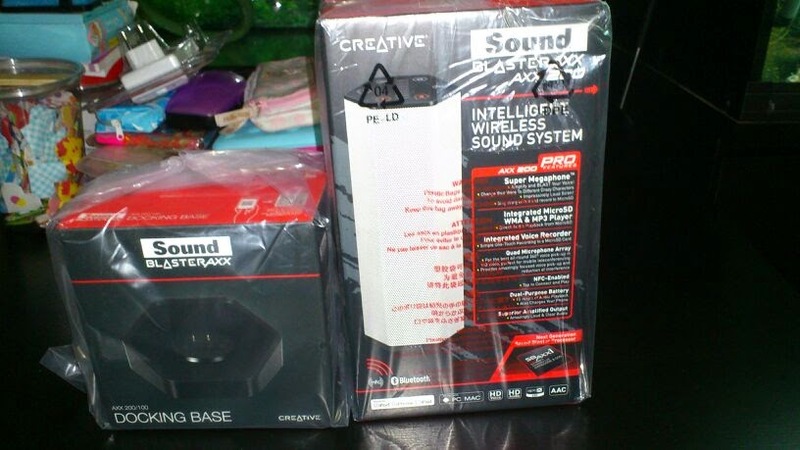 Creative should market sound blaster axx 200 and roar to Singapore govt. Schools, govt depart, events may make use of these products to lower their costs or improve productivity. It's good to see singaporeans support local companies. But we have not seen any support from the govt. sound blaster roar interest subsided due to delays? omg. no wonder pple sell on rebound. Poor sim, sabotaged by china again. Sound blaster roar shipment delayed indefinitely. Yes, poor shareholders. Sim should sell the whole company and forget about turnaround. soundblaster axx 200 available in many countries now but only through creative.com. so what? no sales? no retail channel? do you know this product needs marketing pple to demo to sell, just like ces, it show etc??? Global launch came too late. Be prepared to slash prices or even write off inventory if sales hardly any. Now can only try to do corporate sales. Must market sound blaster axx 200 like every household should own one, how pple use at home, outside, work, kids, toddler, adult, old, birth, marriage, funeral. Singapore buyers = rip off creative. get free woof, delivery delay for a while, complain and make noise. get another free gift, complain and make noise. Patriotic? Support local company rebound? Sell the company away and return money to shareholders. Another china sabotage, just like hanzpad? umm Jimmy, where is the review? you have enjoyed so many free products and where's the review? you should buy products to support creative. you should tell your family and friends to buy creative products. you should buy creative products for your family and kids.